Two of my tiny twitter-length tales have been published by PicFic (Folded Word) as part of their August theme, Mongrel. One yesterday and one on 13th. I knew they’d come in useful one day! I’m thinking back, trying to discern how I came to write an historical novel. When I was tapping out Morse in the pitching wireless cabins of tropical steamers, it was not in my mind – though I read all the books in the ship’s library. A career in television studios might have brought it about – thirty years working with stories in pictures soaks the mind with images. Now I’ve retired I have more time to imagine at leisure – perhaps I’ve just reached the proper age to be a teller of stories. This tale is about ‘Tom Fleck’ and his struggles to be a free man in Cleveland, North Yorkshire, but a Cleveland of five centuries in the past. The story of an unknown man. It is the first session of a creative writing course at Whitby Coliseum. The tutor calls out: ‘I want a fifty thousand word draft of a novel from you lot by the end of term. You can take the theme: ‘something lost and something found’’. Four years later and it’s finished. Tom is a young Cleveland (Yorkshire) farm labourer living in 1513, the fourth year of Henry VIII. I’ve drawn out a character from the unrecorded masses, so that we can engage with the lives of ordinary people of the Tudor North East. He lives before 1566 and the beginning of parish registers so, like his humble neighbours, he leaves no record. But this is a beauty of fiction; we can use it to breathe life into lost generations. Baptisms 1596, September 19th: Christoferye child of Willm. Fleck. I like to imagine that William heard tales of how his great grandfather, Thomas Fleck, loved a strange woman and stood with the army on the terrible battlefield of Flodden. This story brings him to life. The characters seemed to manifest on stage as they wished and I was startled at how they came to inhabit and then to control the story. I chose the year 1513 because an international conflict would disturb the hum-drum lives of the Flecks. I’d not expected that the struggle on Flodden Field would become such a dominant feature – but it drew me in. I’ve squinted through glass at The Royal Armouries at Leeds, made notes of the footwear of archers and saw how they slung their arrow sacks, gawped at the metal work of the English bill and the Scottish Lochaber axe; wondered at the unwieldiness of the 18 foot Swiss pike. A friend’s casual remark caused a rewrite. That fine historian insisted that only yeomen (men with investment in the land) were allowed the long bow. Common labourers were not trusted with the equivalent of the modern rifle. I had now to find good reason for lowly Tom Fleck to carry his grandfather’s bow. The same friend was writing a learned work on the drovers and drove roads of the North country. Now Tom Fleck could wander these same forgotten tracks. Each Christmas I’d chat up my son’s partner, who is a herbalist, to discover more about the old ways of healing among the peasants. After the first draft was done, I discovered that Fleck is not in fact a Cleveland name – but hails from Galloway! Tom could have a change of surname or I could do a rewrite that would explain how he came to have Scottish forebears. I did the rewrite and found new and richer threads of possibility. People sometimes said, ‘You can’t have Rachel Coronel in the story, the Jews had been banished and did not return until Oliver Cromwell’s time’. Rather than cut her fascinating character and that of her father, I dug and dug. Great joy when I found that just a few useful Jews were permitted in London. In fact, it was a later Iberian Jew visiting London who gave warning to Elizabeth that Spain was building the Armada. And when you have hints of love between cultured Jew and Yorkshire labourer – what would be the outcome? This led to interesting issues in an England just a few years before the Reformation. They waited for a day of drizzling low cloud when they could dig the mound in secret. Clear weather would paint them, like standing stones, against the skyline. Francis sat on a rock in the clinging mist and, grey-faced, stared at the burial mound. His eyes closed and his face softened. Not for the first time Tom watched his father fall into a trance. She fixed him with a desperate stare and struggled to speak. ‘Where else can we live? We can’t just wander the tracks from parish to parish. But I don’t want to stay here, not now Mam and Dad are gone.’ She let out a sobbing cough. Tom stopped eating and moved to her side. He put his arms around his sister and felt the trembling of her thin shoulders. ‘Now, don’t fret. We will have our own spot. There’ll be apple and damson trees, with hens of all colours scratching about underneath. Mind – thou will have to tend them. Meg can have some pups and they’ll have white stars on their foreheads like her own. I see a milking nanny goat to build you up and you’ll have a cosy bedchamber – with a mirror of polished brass so you can see to comb through your bonny locks.’ He stooped to kiss the crown of her head. Agnes Humble stood, knife in hand, staring, as she often did, towards the single-toothed outline of Roseberry Topping. The hill reared up in isolation as though cast adrift into the Cleveland ploughlands from the dark crags of the moor edge. As a girl she had done some courting on the sheep-cropped turf of that hilltop. Each morning when she looked that way, she remembered him and those bright days. Where has all the time gone? But let’s not give too much away. The novel took a while longer than expected. It trundled for a year while I studied creative writing with the Open University. I hit the keys for ‘The End’ twelve months ago, and went on to revise and revise and revise. I began to agonise over semi-colons and Mark Twain’s rule of: ‘When you see an adverb – kill it’; this was a sign that the actual storytelling might be done. Tom is now free to walk out of the door and range across the North, over the Land of the Three Rivers (County Durham) and beyond. 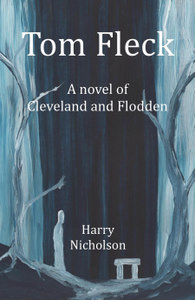 Tom Fleck is listed on all Amazon sites (at £7.99 but often discounted). There is also a Kindle version that has been professionally converted. The first chapter can be read on my Blog. There are also poems, short stories and some art work. Let’s suppose you’ve spent two or three years writing a novel. You’ve put your baby up for a public slapping at the hands of complete strangers, edited, rewritten, gone into a six-month decline during which you couldn’t even bring yourself to open the file, pulled yourself together, rewritten once more to be on the safe side, and decided to publish and be damned. It’s been a long, long journey. And now it’s time for the crowning glory, the icing on the cake. The cover. You’re brimming with great ideas. After all, you’ve given birth to this baby – who can do a better job than you? You’ve got a design application of sorts on your computer, you know how to manipulate pictures in Photoshop using all those fantastic artistic effects, and you’ve got 1,200 (yes, twelve hundred) fonts to choose from. And if that’s not enough, you can download unlimited free ones. There must be something with hair growing out of it that will go really well with your photoshopped polar bear-into-a-yeti! You create a document the right size and get all the elements into the space. Some of the words don’t read very clearly, so you change them to red. No, blue. Plain black’s best, isn’t it? Should your name be in the same font as the title? At the top or bottom? Ranged left, right or centred? Maybe it’s a bit too hairy. Is it that important, just as long as it’s nice and big? Now you’ve finished. You print it out on best coated paper and show your mum when she comes round with the washing you haven’t had time to do while you’ve been creating your masterpiece. Her eyes mist. With this endorsement, you send your completed book off to your POD supplier and order a crate-full. They print exactly what you sent. Hmmm. That black type makes it look a tad funereal and it still doesn’t read too well. And there’s a bit of a line where you grafted on the yeti’s head. Not to worry. The blurb will hook the readers in, won’t it? Well… maybe, maybe not. Here’s my question. Would you save up for months to buy a designer dress then cover it up with a baggy old cardi (for men less in touch with their feminine side, insert lovingly restored vintage car and Pound Shop seat covers)? Of course you wouldn’t, so you get what I’m trying to say? The advent of self-publishing has given everyone a chance to indulge their creative side, often at the expense of the credibility of their product. I’m going to stick my neck out and say that the majority of homemade covers look just that – homemade – albeit the finish is glossy. Or matt, for preference. This isn’t a cake for the village fete, destined to be consumed within the hour! It is the ambassador for your writing; for the novel that has wrung you dry. It is going to hang around on your coffee table for years, making you wish you’d spent a bit of hard-earned cash to make it look the marvel it is. Doesn’t it – don’t you – deserve better? Graphic designers have had a lean time in recent years, as typesetters and illustrators did before them. Home computers mean that anyone can produce something colourful with a superficially slick finish. Business owners (or their offspring) now design their own logos, brochures and advertisements. Whether it’s good design is another matter. Standards, needless to say, have plummeted. Designers are professionals – they go to college for four years, learn the history and context of design, are trained, often up from a lowly junior position, accepting poor wages in return for knowledge. They have insight – a talent for knowing what works and what doesn’t, and an inbuilt sense of colour, form and balance, which is greatly enhanced by experience. They understand that for a design to work, there must be tension – a relationship – between the elements. They take risks but know when to stop. They can’t explain how, they just know. So, if someone who isn’t in a creative industry asks someone who is what they can do to improve their DIY cover artwork, it’s a fair bet the answer isn’t going to be hopeful. Only rarely will it be a case of simply changing the colours. Bin it and seek the services of a professional could (and should) be the response. At the risk of appearing to be touting for work, which I’m not, this is my advice. When you’re ready, contact a designer. Go by recommendation and ask to see samples of their work. Tell them your ideas and ask for a price. Most designers will tailor their costs to suit the client, whether you need a full-blown presentation and selection of covers from which to choose, or the relatively simple realisation of your own idea. Choose carefully and make sure they understand your needs and desires. Don’t accept anything you’re not happy with, but be guided by their expertise – a good designer will know best. Don’t, in short, get out the twenty-first century equivalent of gummed paper shapes and do it yourself, unless you’re prepared for the consequences. The buying public, you’ll find, does judge a book by its cover. Although I am a graphic designer with 35 years’ experience, I have only designed a few book covers so far, including my own project, Triclops – see left. I’d be happy to recommend an excellent designer if you leave contact details. Today I am guest-blogging about writing short stories over at Jo Reed’s place. Please pop over and have a read, leave a comment, ask a question or tell me what you did with the plums. Noted British novelist Graham Swift is quoted as saying that contemporary novels are “an impossibility”. He reasons that since books take a protracted period to write, that even if the author starts off a new project in the now, that ‘now’ has moved on already way before he or she types the final full stop. Trying to define fiction or what a novel actually is, also usually involves some notion of a fictional character moving through a period of time, usually in the past, whether recent or historical. But the emphasis is very much that period in the past. Um well I respectfully beg to differ. Actually I disrespectfully beg to differ, but I’m a guest here so am trying really hard to keep it polite. I only write contemporary novels. Novels that engage with my times. Books that interrogate them. Stories that speak of and to my experience and hopefully to those of readers as well. My debut novel is about binge culture, through the filter of the British when they travel abroad. That unalloyed sybaritism (pleasure seeking) that so permeates our culture today. It also explores the gangsterism and criminality, tracing its development in the 1980’s through to today. It has a riff about the ubiquity of camera phones and the content people record with them, as witnessed in last week’s riots. I am also about to release on kindle a book about a home grown suicide bomber and where people turn to when they feel the limits of protest within a democracy yields no redress. Again, none too dissimilar themes to what we have just witnessed behind the riots and harping back to the recent paranoia in the wake of the bombs on the London Underground at 7/7. Go on admit it, if you live in or near an area hit by last week’s riots, for a couple of days at least every time you heard a siren now, you wondered if it was starting up again. Well that’s what it was like for us Londoners using the Tube for a couple of months after 7/7. Scrutinising the face of every other person in the carriage. Staring at their luggage… Fear. Dread. Insecurity. I will, and have, written about them in these contexts, because such feelings persist. The catalysts may change from year to year, decade to decade, but not the emotions involved. And back to the riots. I have written an unpublished novella about gang culture and youth on youth knife violence. It is told from the parents’ point of view, in order to demonstrate the yawning gap in understanding (and language) between the generations. Lo and behold, what do we have demonstrated in the riots, but a complete paucity of understanding between the authorities and the rioters with no stake in society, where there is no possibility of mutual understanding, of communicating even one to another? I am not a seer or a prophet. But I do observe. I do try and engage and understand the world around me. And I reflect on it and I metaphoricalise it and I fictionalise it and I release it in the form of novels. So please don’t tell me you can’t write contemporary fiction. For me the question is maybe why you wouldn’t. Yes writing about the Romans or the Tudors can shed the odd insight on to our times, because some things like the lust for power don’t change. But how less tangential and indirect to try and deal with things in our own immediate purview. I got my university degree in history and one thing it taught me was that although it does often repeat itself, one can never be sure which bit of history is going to repeat itself when… And then the conditions are never the same across any two eras. I openly acknowledge the possible shortcoming of writing contemporaneously, as outlined by Swift in his full argument. How such books risk becoming dated in their references, when such references are those of today, but not necessarily those of tomorrow. But I have two responses to that. Firstly I welcome the word risk. It admits of the possibility of a book daring to go further than the anodyne. My books take plenty of risks, stylistically, linguistically, as well as in the ideas they deal with. Getting some of the ideas wrong in the fullness of time hasn’t invalidated plenty of ‘classics’. “Oliver Twist’s” portrayal of London’s pickpockets hardly stands scrutiny with today’s exponents on their BMX bikes and hoodies; does that make Dickens’ book any less worthy of reading? Soviet Communism is over, yet Bulgakov’s satire of it in “The Master And Margarita” which I recently read for the first time, is no less enjoyable. You didn’t have to consult the notes in the appendix if you didn’t want on all the specific allusions to apparatchiks and institutions, the book still works all of a piece. Secondly, the details may change, but the trends and human behaviours under scrutiny do not necessarily. My novel about binge culture deals with our human inquiry into what makes us happy, what the nature of pleasure might be. Because it is set in Greece, it encompasses the classical Greek philosophers’ musings on the nature of pleasure and considers how far removed we here and now find ourselves from any real conscious understanding of why we follow the pursuits we do. And that coincides with inquiries our discontented society is now starting to make as the dust settles on the riots. Marc Nash has two novels coming out on Kindle in August. “A,B&E” & “Not In My Name” and book trailer. Hi – I’m Jo – and I’m a writer … Over the last ten years or so, I’ve met some fantastic writers, either face to face or by email and online contacts. During that time, some have gone on to achieve publishing deals, while others are still awaiting the break their talent deserves. But there is one thing they all have in common – writing is their vocation, their special gift and, regardless of circumstances, they carry on doing it, through thick and thin, good times and bad. Passion drives them, and a day without words on the page is a day not lived. I used to think I was the only person to wake up at 3 in the morning and force myself out of bed to note down that perfect sentence, or refuse to answer the door for days on account of a sudden rush of plot movement ending weeks of verbal constipation. Some write at dawn, others through the night. Some get inspiration from crowds in cafes, some lock their doors and stay hidden for months. I’m the kind of writer who likes to get feedback as I’m going through a draft, but I know people who will spend years honing a manuscript and keep it in a locked box until the day it appears in print. However and whenever it’s done, the creative process is a bit like giving birth to octuplets a year late and without anaesthetic (or at least I imagine so, only ever having managed a couple of week overdue 9 pounders and not at the same time). Aside from keeping odd hours, an obsession with words and a masochistic urge to hurl ourselves at the pain barrier over and over again, there seems to be another unifying trait that writers share – a deep reluctance to acknowledge that this is actually what, and who we are. It is as though being a writer is almost a shameful secret, like being an obsessive gambler or a drug addict. Writing isn’t a job – it’s something people do in their spare time because they are too lazy or self-indulgent to do anything useful. We should go to bed at the proper time like everybody else, get up in the morning and behave like other people do. We should spend our evenings/mornings/nights being sociable, going to the pub, to the cinema, or even, if we can’t manage that, watching TV. But writing? That’s just crazy. Thing is, I’m not sure being crazy is such a bad thing – I share my living room with around two thousand crazy people, and some have been dead for thousands of years. If, in a few hundred years’ time, I’m sharing shelf space in someone’s living room, the whole thing will have been worth it. But for now, it’s just another late night with the phone off the hook. Jo Reed lives and writes in the Southwest of England. She is the author of the Blood Dancers series of novels, published by Wild Wolf Publishing. 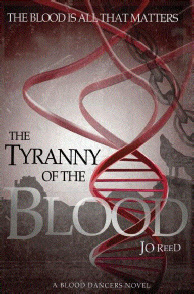 The first novel in the series, The Tyranny of the Blood, won an Arts Council funded Apprenticeship in Fiction award in 2009, and was published later that year, followed in 2010 by A Child of the Blood. Jo won the Daily Telegraph travel writing prize in 2009, and her short stories have appeared in many national magazines, including Mslexia, The People’s Friendand Lancashire Magazine. Her next Blood Dancers novel, Malim’s Legacy is due for publication in late 2011/2012, and she is currently working on a fifth novel. Visit Jo’s website. The editor of my local paper, The Ross Gazette, gave Triclops the thumbs up on page five this week, and the owner of the bookshop rang me to get more copies. I’m well-pleased.